Agency leaders were flanked by representatives from the 20+ U.S. Food Loss and Waste Champions – organizations that have committed to reducing food loss and waste in their own operations by 2030 in alignment with Target 12.3 of the Sustainable Development Goals. The event was attended by many food system leaders, long-focused on unlocking the immense social, environmental, and financial benefits currently trapped in the excessive levels of food (more than 100 billion pounds) going to waste annually in the United States. The formal agreement cites the need to educate all supply chain actors on best practices to reduce food loss and waste from farm to fork, and the impacts (i.e. benefits) that can be achieved through collaboration. It also notes that while some progress has been made to date, there is still much work to be done. 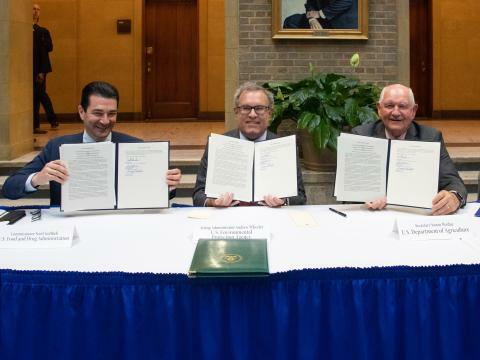 USDA Secretary Perdue noted that the signing of this Agreement represents the government’s commitment to food loss and waste reduction. U.S. Secretary of Agriculture Sonny Perdue, Acting EPA Administrator Andrew Wheeler, and FDA Commissioner Scott Gottlieb, M.D. holding up their signed agreements. We agree with all of these points. We applaud the government’s stated commitment toward reducing food loss and waste, and we were pleased to participate at the event. Food waste reduction is a goal we can all get behind, and we at LeanPath stand ready to partner with the government and organizations all across the food supply chain to meet that goal, because to us, food is too precious to waste.